107km cycling event starting from Wareham. Controls at LULWORTH, WEYMOUTH and DORCHESTER, plus 2 information controls. 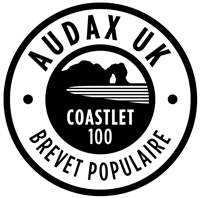 The Coastlet is a shorter � but still tough � 100km little brother to the Dorset Coast 200km. Visiting Lulworth Cove, Weymouth, & Abbotsbury, you can enjoy some of the finest scenery the Jurassic Coast has to offer.